The story starts on April 17, 2003. 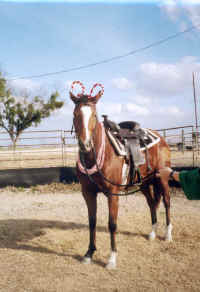 In the black of night, someone crept into a boarding stable west of Houston, Texas, and stole Candy, a three-year-old Quarter Horse owned by Cheryl and Paul Snyder. Whoever took Candy knew that she had just been moved there from another barn. The thief also knew that she was affectionate and amenable, attributes that made her an easy mark. Cheryl was overcome by grief when told her beloved mare was gone. She took 10 days off work from Wal-Mart, where she is a tissue-paper stocker, to regain her composure and to mount a massive search. 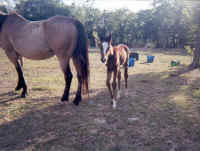 Soon she learned three sad facts: that rustling is a profitable business in horse-happy Texas, that stolen horses are rarely recovered, and that the likely fate of an embezzled equine is the slaughterhouse. There are two such plants a few hundred miles north of Houston. Fifty days later, I saw the Snydersâ€™ plea for help on a local horse rescue website. It featured photos of Candy, a detailed description of her markings, and a generous reward â€œfor the safe return of our child to us.â€� The news broke my heart. I wanted to push it out of my mind, to avoid the pain. But I couldnâ€™t bear being a Bad Samaritan. So I e-mailed Cheryl, asking how I could help. That was the start of a regular correspondence and the birth of a friendship based on our shared certainty that Candy would be found â€“ not by luck, but by God, whose love for His entire creation is never-ending. The Bible was Cherylâ€™s lifeline. Every morning she found comfort and renewed hope in one of King Davidâ€™s Psalms. The day we met online, she had already taken to heart Psalm 50â€™s â€œFor every beast of the forest is mine, and the cattle upon a thousand hills.â€� (Psalm 50:10) â€œAnd horses,â€� she inserted. Five days later, Psalm 55 assured her that if she would but â€œcast (her) burden upon the Lord,â€� He would â€œsustainâ€� her (Psalm 55:22). She did. So He did. That was on November 3, 2003. Exactly three months later, Cheryl announced that she and Paul were moving to the Austin area, to live closer to his job. 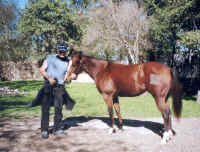 Though still convinced that â€œCandy never left the Houston area,â€� she was nonetheless willing to take this progressive step, even if it meant being farther away from where she felt sure her horse was being kept. The same month, Sandi West entered the story. 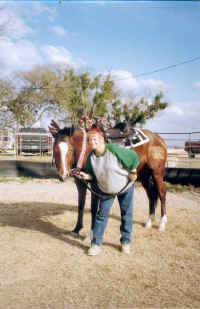 A single mom living in Houston with three children, ages 23, 17 and 15, Sandi had dreamed for years of owning a horse. She resolved that 2004 would be the year. The purchase would be made with her income tax refund. A glitch held up the refund until May. A few days after the check arrived, Sandi went to watch a farrier shoe several horses at a farm 25 miles north of her home in Houston. The owner of the property, Mr. X, mentioned he had a couple of young horses for sale. As they walked down to the pasture, Sandi had no idea why she had agreed to look, since her heart was set on having a Paint horse and logic told her that novices shouldnâ€™t ride unseasoned equines. But the minute she saw the â€œgorgeous coloring and conformationâ€� of Tweetie, she was smitten. The next day, Sandi returned with the $700 purchase price. She agreed to board Tweetie at Mr. Xâ€™s for a modest monthly fee. For the next five weeks, Sandi drove the 50-mile round-trip daily to see her new best buddy, renamed Sweetie. She groomed her, fed her carrots, and rode her in the neighborhood. Being thrown several times didnâ€™t phase Sandi, nor did the stomach bruises she endured from the saddle horn when Sweetie reared. Her friends asked why she didnâ€™t â€œget rid ofâ€� the horse and buy a mature one. Sandi refused. She loved Sweetie, and envisioned getting past the bucking stage to enjoy a long-term relationship. Mr. X introduced Sandi to a feed store up the road apiece, in Porter. One day in late June, when her 17-year-old, Clayton, was building a stall for Sweetie, Mr. X told Clayton that heâ€™d seen a stolen-horse flyer at the feed store with Sweetieâ€™s â€œtwinâ€� on it. The next day, Sandi and Clayton drove to the store, asked for the flyer, brought it back to the pasture, and held it next to Sweetie. A tearful Sandi then called the Snyders. Paul answered. â€œI think Iâ€™m looking at your horse,â€� she bawled into the phone.